Dubai, UAE, September 8, 2018: Samsung Gulf Electronics today introduced the new Samsung Galaxy Watch in the UAE. The Galaxy Watch brings the best of the Samsung’s Galaxy ecosystem with long-lasting battery life, wellness capabilities and a timeless and personalized design. 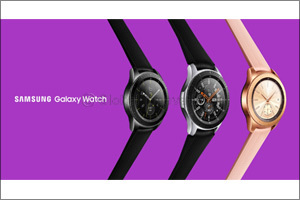 Galaxy Watch helps users accomplish more with new stress and sleep monitoring capabilities, in addition to offering a more robust line up of style options including three new watch faces in Silver, Midnight Black and Rose Gold, and new customizable watch band colors. Designed with wellness in mind, Galaxy Watch offers a true holistic health experience with its new stress management tracker , which automatically detects high levels of stress and offers breathing exercises to help keep users cetered and focused. In addition, a new advanced sleep tracker monitors all levels of sleep, including REM cycles, to help users adjust sleeping habits and get the rest they need to take on their day. Galaxy Watch brings users all the benefits from the Galaxy Ecosystem creating a seamless experience with Samsung Health, Samsung Flow, Samsung Knox, Samsung Pay , Bixby and with partnerships like Under Armour. Samsung makes music and multimedia control even easier on Galaxy Watch in addition to keeping information secure with Samsung Knox and easily unlocking PCs or tablets using Samsung Flow.